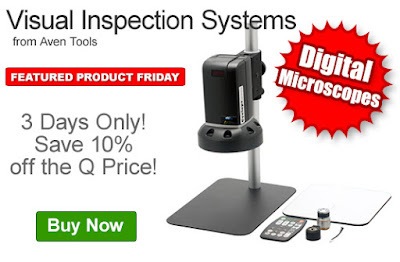 Get 10% off the Q Source price of Aven Tools Visual Inspection Systems. Our FPF081216 Coupon Code is auto applied when you add an eligible visual inspection system to your shopping cart. This Featured Product Friday (FPF) promo is valid from today, August 12, 2016 through Sunday, August 14, 2016 and the code is unlimited use. These Aven Tools Visual Inspection Systems feature their high-quality digital microscopes. Choose from three different models with a variety of specs to meet your inspection needs. For further questions about Featured Product Friday, please read our informational blog post, call us (800-966-6020), or send us an email. Please note: This promo is valid only at QSource.com and expires on August 14, 2016.